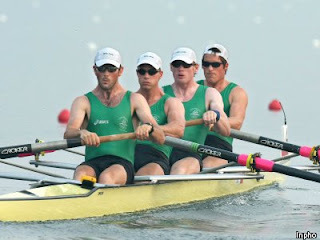 Ireland's heavyweight four will race in tomorrow's 'B' final after finishing sixth in today's semi-final. Sean O'Neill in the stroke seat, Sean Casey, Jonno Devlin and bowman Cormac Folan put in another encouraging row as they clocked 5 mins, 58.14 secs - over four seconds faster than in the heats. In the single sculls, Coleraine man Alan Campbell, rowing for GB, pulled back to finish second and make the final. Campbell's appearance at these Games had been in doubt after a tooth infection bizarrely spread to his knee, putting him on crutches. He is one of three Coleraine men rowing in Beijing. Richard Archibald is part of the Irish lightweight four that competes in the semi-finals tomorrow (Thu), while Richard Chambers races with the GB lightweight four that won the world title last year. Both Campbell and Archibald were in Athens at the last Olympics and Chambers says that more Colerain rowers are on the way. 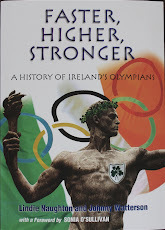 "My younger brother Peter and a couple of others from Coleraine Inst are representing Ireland at junior level and hopefully seeing what we're doing will inspire more young guys to take rowing seriously. "I try to be a good ambassador and advocate for rowing and will do whatever I can to promote the sport and support the clubs. Coleraine has become a real rowing town and I'm very proud of that," says Richard, who went to Oxford university.